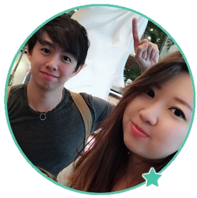 Obcasio Review - Binary Options Scam Exposed! Obcasio software is the latest binary trading robot that spreads like a wildfire on the internet. If you are looking for an authentic review, you’ve come to the right place. Their sales video may seem credible, but it’s all a big scam. In this Obcasio review, I’ll reveal why the software can’t make you a penny – instead you’ll lose all your hard-earned money with it. We’ll also look into the inner workings of the scam, so you can be fully informed before making your own decision. Obcasio software has been aggressively pushed to unsuspecting internet users who are looking to make quick profits online. As usual, click-profit systems like Obcasio are a dime a dozen, but none of them actually work. In fact, these scams are so common that no one should be falling for them anymore. They can be found from unsolicited internet pop-ups, shady emails in your mailbox, or shiny banners on the side of an article you just read. If any of these software are half as good as they claim – you’d have seen millionaire traders everywhere. So why are people falling time and time again to the same tricks? Take a look at the email sent from my reader, Sam. Since I started guiding people away from scams, it’s not unusual for me to receive multiple emails a day asking me to expose new scams. There’s a reason why you looked for reviews of Obcasio and found this article. The whole deal just sounded too good to be true, as they are literally trying to give free money to you. Is there free lunch in this world? Well of course not. My aim for this review is to expose the underground dealing of the scam, and to educate people on the dangers of binary options. 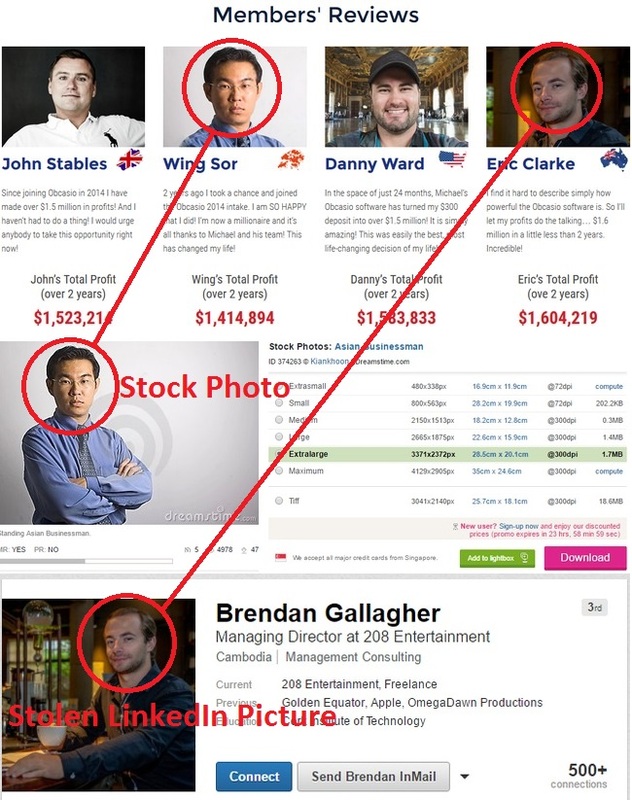 Before we get started, let’s take a look at a concrete evidence to prove that Obcasio is indeed a scam. People LOVE to read testimonials and success stories. Take myself for example, I loved to read the success stories from the users of products that I’m about to buy. It gives me confidence because if other people made it work, why not me? And of course the scammers know about this. They know how easy it is to generate fake member profiles to fool their victims, and so they did. I’ve had multiple readers who fell for scams because of fake testimonials. So one of the common scam tactics is to steal pictures of individuals from all over the internet, plaster them onto fake names and attach some ridiculous profits to them and – voila! You have a fake testimonial that appear legitimate to the untrained eyes! It’s dangerous to trust testimonials of products that seem too good to be true. We all now that. Unfortunately, sometimes there is no way to identify them right away, but look at the total profits of these so-called members. Most of them are making over $1.5M dollars in the span of 2 years using a click-profit software that runs automatically. Unless you are living in an alternate universe, you should’ve sniffed this scam from a mile away. How Does Obcasio Scam Make Money off You? Just as they claim, Obcasio software is in fact a trading software designed to trade binary options on your behalf. It’s true that you don’t have to do anything and the system will place trades automatically. But the truth ends here. Any promises that go beyond this, such as generating at least $2,000 a day on autopilot, and making you a millionaire out of thin air are purely bogus and deceptive. If you don’t already know – binary options is a trading instrument that sees over 95% of their traders lose money. Yes, a staggering 95%! Guess what, even Forbes published an article to warn people against gambling with binary options. Did you notice how Michael Watson only scraped the surface when he talked about how the software works? He emphasized a lot on the “speed” of the software, and how it manages to outperform the market due to superior servers. Well, the obvious reason behind the lack of logic is simply because the software doesn’t make money. It’s a scam and the main purpose is to get you to deposit money, but what do they gain? Notice that if you sign up for an account through Obcasio website, you’ll be redirected to a broker page. This broker is partnered with the scammers behind Obcasio, and that’s why you can’t choose your own broker. The next step is to fund your account with at least $250 to activate the software. You’ll be told that the money is still yours, you just need to deposit a couple hundred dollars to start making much more. And this is where they get you. Once you activate Obcasio app, you’ll see your account balance wither away in a matter of hours. Usually, most victims lose all their money within 24 hours. This is a simple diagram on how the entire scam works. Unlike the stock exchange, the brokers of binary options don’t make money through trade commissions. They MAKE MONEY FROM YOUR LOSSES. Most innocent traders don’t know that the brokers of binary options have direct conflict of interest when it comes to trading. The more money you make, the more your broker loses. So it’s in the brokers’ best interest that you lose as much money as possible. To attract new victims, they partner up with scams such as Obcasio that send them new traders and fresh investments. 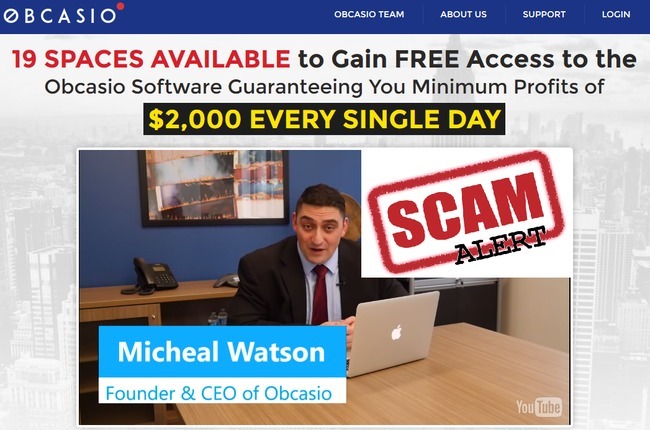 When these victims inevitably lose money, they pocket the losses and share the money with their partner-in-crime – the scammers behind Obcasio software who brought them the victims in the first place. This is a complicated fraud with the victims as the sole loser. Don’t ever sign up to a binary trading software, and stay away from the binary options market. OBCASIO IS A SCAM. I strongly advise you to stay away from the scam if you don’t want to lose your hard-earned money. Thank you Edward. Yours is the only real review I’ve found online, others are either trying to direct me to another binary software or shady signals. I’ve tried many and know they don’t work, and now I know why! Thanks a bunch! Glad it helped you Mandy! Stay out of scams! Its so bad that nothing legal have been done to the fraud and unethical activities of this binary options phenomenon,I lost $46750 of my life savings,I was scammed by Steven Silver and his group of associates who refuse to approve withdrawal request,this guys are 5 star rated on most ratings and blogs,they stopped picking my calls and even threaten me with a law suit,imagine? this group of people are a disgrace to human race,I tried all I could to get my money back,went as far as reporting to A.S.I.C, but still nothing happened,I almost gave up till I met my one time account manager Christopher Jones,who gave me an unofficial advice to hire a hacker he knows to help get me funds back,I really didn’t believe but still went ahead,ill say he was very professional and told me am not alone in this,he got all the relevant information and in about six days,I was able to log on to my account,although I wasn’t able to withdraw the gains,I was able to withdraw all my initial deposits and assets which was more than I expected,I think this can help someone here too.